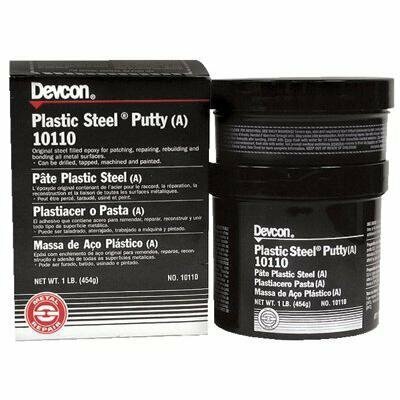 Devcon 10130 Gray Plastic Steel Putty (A), 25 lb. On Sale Now! Save 10% on the Devcon 10130 Gray Plastic Steel Putty (A), 25 lb. by Devcon at In The National Interest. MPN: 10130. Hurry! Limited time offer. Offer valid only while supplies last. Devcon Plastic Steel Putty is the original metal-filled epoxy putty used for hundreds of routine maintenance, production and tooling applications. Devcon Plastic Steel Putty is the original metal-filled epoxy putty used for hundreds of routine maintenance, production and tooling applications. Patch and repair areas where welding or brazing would be undesirable or impossible. Bonds to most metals, concrete and some plastics. Excellent resistance to oil, gasoline, water and many chemicals.